September | 2014 | In Domino Spera! A multi-part series honouring the Vatican Council II by reviewing its documents. We continue with a review of the Constitution on the Sacred Liturgy. 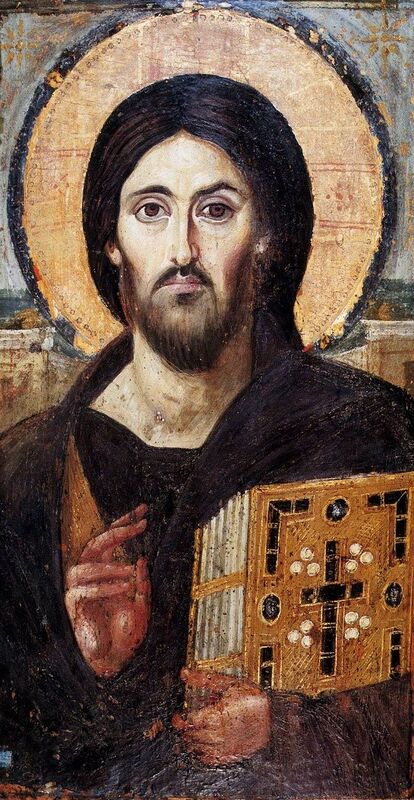 The oldest known icon of Christ Pantocrator (Christ the Lord of Hosts), encaustic on panel, 6th century. The two different facial expressions on either side seem to emphasize Christ’s two natures, fully God and fully man. Saint Catherine’s Monastery, Mount Sinai. Very rightly the fine arts are considered to rank among the noblest activities of man’s genius, and this applies especially to religious art and to its highest achievement, which is sacred art. These arts, by their very nature, are oriented toward the infinite beauty of God which they attempt in some way to portray by the work of human hands; they achieve their purpose of redounding to God’s praise and glory in proportion as they are directed the more exclusively to the single aim of turning men’s minds devoutly toward God (no. 122). You see, contrary to popular belief today, art isn’t about self-expression. Up until the 20th century, art was always understood to be an attempt to represent and convey the deep truths of beauty, the human person, and man’s longing for the infinite. True art always leads us outside of ourselves, even beyond the artist, toward something greater. This is especially true of sacred art, whose object is God and the divine mysteries. For this reason the Church has long been one of the biggest patrons and contributors of art. Just look at the Vatican Museums! For these same reasons, the Church has also intentionally incorporated artistic craft and merit to its various objects of practical use, such as vestments, sacred vessels, and church buildings. [A]ll things set apart for use in divine worship should be truly worthy, becoming, and beautiful, signs and symbols of the supernatural world […] in accordance with faith, piety, and cherished traditional laws, and thereby fitted for sacred use (no. 122). Just because something is useful or practical, it doesn’t mean it should be ugly and poorly made. This is a multi-part series honouring the Vatican Council II by reviewing its documents. As discussed in previous segments, the entire Liturgical Year hinges on the Paschal Mystery, annually at Easter and weekly on Sunday; our whole faith-life revolves around the Passion, Death, and Resurrection of Jesus. The Council Fathers sought to help us rediscover the importance, beauty and spiritual wealth of the Liturgical Year. b) The same may be said of the penitential elements. But catechesis, as well as pointing out the social consequences of sin, must impress on the minds of the faithful the distinctive character of penance as detestation of sin because it is an offence against God. The role of the Church in penitential practices is not to be passed over, and the need to pray for sinners should be emphasized. During Lent penance should not be only internal and individual, but also external and social… Nevertheless, let the [solemn] Paschal Fast be kept sacred. Let it be celebrated everywhere on Good Friday and, where possible, prolonged throughout Holy Saturday, so that the joys of the Sunday of the Resurrection may be attained with uplifted and clear mind (nos. 109-110, emphasis added). But in all of this we must always remember that penance is not about suffering. Penance is about sacrificial love: it’s about letting go of something good for the sake of something better, out of love for Someone greater. Love is to be the motivation for penance; in this way it helps us to grow in charity and in the detestation of sin (no. 109). It also helps us to refocus our hearts and minds on Jesus and the importance He is to have in our lives, and to redirect our efforts toward our salvation. [Jesus’] divine power has given us everything needed for life and godliness, … so that through them you may escape from the corruption that is in the world …[and] become participants in the divine nature. For this very reason, you must make every effort to support your faith with goodness, and goodness with knowledge, and knowledge with self-control, and self-control with endurance, and endurance with godliness, and godliness with mutual affection, and mutual affection with love. Therefore, brothers and sisters, be all the more eager to confirm your call and election, for if you do this, you will never stumble (2 Peter 1:3-7, 10). As discussed in the last segment, the entire Liturgical Year hinges around the solemn celebrations of the Paschal Mystery, annually at Easter and weekly on Sunday, which is the Lord’s Day. Consequently, after renewing our moral obligation to attend Mass on Sundays (no. 106), the Council Fathers issued a series of decrees to emphasise the importance of the Liturgical Year and their desire for a rediscovery of its beauty and spiritual wealth. “The liturgical year is to be revised so that the traditional customs and discipline of the sacred seasons shall be preserved or restored to suit the conditions of modern times; their specific character is to be retained, so that they duly nourish the piety of the faithful who celebrate the mysteries of Christian redemption” (no. 107). In other words, the various traditions we have that are linked to Liturgical Seasons or feasts should be in accord with those Seasons and feasts. For example, the Eastern European tradition of the blessing of Easter food. Historically, the great Lenten Fast was quite severe — as it still is for some Eastern Catholics: people would abstain from all meat and animal products (such as eggs and dairy) for the entire Season of Lent. At the Easter Vigil or on Sunday morning they would gather these foods into a basket and have them blessed by the Priest in preparation for their Easter banquet. But the solemn fast of Good Friday was also severe, and people had to fast from Friday until the Easter Vigil. Over time, it happened that the Easter Vigil ended up being celebrated either at 12noon on Holy Saturday or even earlier, because people could not maintain the fast. Hence the practice of blessing the Easter foods also came to be earlier and earlier on Saturday. Recognising that this was problematic — the fast too severe, and the loss of the sense and symbolism of what a Vigil is supposed to be (a night-time anticipated celebration of the a major feast) — in 1955, Pope Pius XII reduced the fast and restored the Easter Vigil to the night (Maxima Redemptionis). All other traditions that prematurely celebrate the joy of Easter — such as the blessing of Easter foods — were also to be postponed at least until the Vigil. This is because the “minds of the faithful must be directed primarily toward the feasts of the Lord” (no. 108). We cannot hold more to customs and traditions than to the spirit of the Liturgy. Doing so reduces the various Seasons and feasts to mere cultural events that, over time, become disconnected from the mysteries to which they are supposed to direct us. For this same reasons, “the proper of the time [the Liturgical Seasons] shall be given the preference which is its due over the feasts of the saints” (no. 108). As discussed in last week’s segment, the entire Liturgical Year hinges around the solemn celebrations of the Passion, Death and Resurrection of Jesus: the Paschal Mystery, or the Easter mysteries. This enables us, each year, to rediscover and relive the whole of the life of Christ, by which we sanctify time, as it were, dedicating each year and season to Jesus our Lord (think here A.D.: Anno Domini, Latin for Year of the Lord). Consequently, it’s not by accident that we begin each Liturgical Year by preparing for the Nativity of Christ and finish it by anticipating His return in glory with a feast in honour of His Kingship, the Solemnity of the Christ the King of the Universe, on the last Sunday of Ordinary Time (usually at the end of November). Additionally, “[i]n celebrating this annual cycle of Christ’s mysteries, holy Church honours with especial love the Blessed Mary, Mother of God, who is joined by an inseparable bond to the saving work of her Son” (no. 103) as well as the Martyrs and canonised Saints, who, “[r]aised up to perfection by the manifold grace of God, and already in possession of eternal salvation, … sing God’s perfect praise in heaven and offer prayers for us” (no. 104). In doing so, the Church proposes these men and women to us as models of faith and examples of God’s grace and mercy. And they give us the hope that if we, too, open our hearts to God’s grace and mercy, allowing the Holy Spirit to change our hearts and lives can become like them. “Finally, in the various seasons of the year and according to her traditional discipline, the Church completes the formation of the faithful by means of pious practices for soul and body, by instruction, prayer, and works of penance and of mercy” (no. 105). Thus the Liturgical Seasons aren’t just ceremonial, they’re also catechetical: by living out the Liturgical Year through the various practices and celebrations it contains, we learn about Jesus Christ, about faith in Him, about what it means to be His disciple, and we grow in our understanding of this mystery; in fact, if we do it well, we’re drawn deeper into this mystery to share more perfectly in the life of Christ, the life to which we are called! It’s for these reasons that the Church makes attendance at Mass on Sundays and Holy Days of Obligation a moral obligation (no. 106, can. 1246-47): except for illness or another ‘grave reason’ (speak to a Priest about what this means), it’s a grave sin to miss Mass on a Sunday, one that requires sacramental Confession before receiving Holy Communion again. For these same reasons we should also “abstain from those works and affairs which hinder the worship to be rendered to God, the joy proper to the Lord’s day, or the suitable relaxation of mind and body” (can. 1247). Most people know that music in the Liturgy has been an area of conflict since Vatican II. What they often don’t realise is that it’s actually been a battlefront for centuries. St. Ambrose (d. 397) fought the use of secular (non-religious) music at Mass when musicians were putting Christian lyrics to common drinking songs so that people would sing more. Similar battles occurred in the 1500s. And in the 1800s, operatic music was banned from the Mass, as various composers and divas were turning Mass into concerts and competitions. Such abuses detract from the prayer of the Eucharist and distort the Mass. Safeguarding Liturgy and preventing such abuses were the primary reasons why it took so long for vernacular hymns (in the people’s language) to be allowed. It wasn’t until Pope St. Pius X defined sacred music and set parameters that vernacular hymns were allowed, but only for liturgies other than Mass (Tra le sollecitudine, nos. 7, 21). He defined sacred music as music that clothe[s] with suitable melody the liturgical text and add[s] greater efficacy to the text so that the faithful may be the more easily moved to devotion and better disposed for the reception … of grace (Tra le sollecitudine, no 1). It must be holy, and … exclude all profanity not only in itself, but also in how it is executed. And lastly, [i]t must be true art (no. 2). Notice how the text is more important than the tune. Popes Pius XI and XII also wrote about music in the Liturgy. The Council Fathers at Vatican II built on these foundations: The musical tradition of the universal Church is a treasure of inestimable value, greater even than that of any other art. …it forms a necessary or integral part of the solemn liturgy, meant to [make] prayer more pleasing, [promote] unity of minds, [and confer] greater solemnity upon the sacred rites for the glory of God and the sanctification of the faithful (no. 112). In other words, music isn’t a decoration to the Mass; it’s part of it. Sacred music is intended to help us better experience and pray the rites and liturgies of the Church. Consequently, the Council Father decreed that while the vernacular may be used (no. 113), [t]he treasury of sacred music is to be preserved and fostered with great care. Choirs must be diligently promoted (no. 114). Liturgical music must be taught and practiced in seminaries, religious communities and Catholic schools (no. 115). Composers and singers, especially boys, must also be given a genuine liturgical training (no. 115). Gregorian chant [is] specially suited to the Roman liturgy: therefore, … it should be given pride of place in liturgical services. But other kinds of sacred music, especially polyphony, are by no means excluded … so long as they accord with the spirit of the liturgical action (no. 116). This last phrase is the essential guide to discerning what’s appropriate for Mass. [S]inging by the people is to be intelligently fostered so that … the voices of the faithful may ring out (no. 118). In other words, singing isn’t just for the choir. [T]he pipe organ is to be held in high esteem… But other instruments also may be admitted … with the knowledge and consent of the Bishop, again, so long as they accord with the spirit of the Liturgy (no. 120). Ps 138: 1-2a, 2b-3, 6,8b R/. Your steadfast love, O Lord, endures forever. Do not forsake the work of your hands. One of my biggest personal strengths is that I’m what you might call a ‘visionary’: I think and see long-term, and big-picture. But if I let myself be carried away with what I envision, it’s easy for me to get lost in what ‘could be’, and that can lead to frustrations when the present doesn’t resemble the vision. That’s why it’s also one of my biggest weaknesses. To prevent this, I always have to remind myself that I’m not in charge, Jesus is. This is one of the reasons why I love today’s Gospel passage. This scene between Jesus and Peter has become rather iconic for us as Catholics. I bet most of us here can quote at least part of these famous lines. And so it’s easy for us to get lost in the ‘big picture’ of what Jesus is saying to Peter and ignore that the true greatness of this passage lies not so much in the ‘big picture’, but in the small details of Jesus’ words. In His response to Peter’s profession of faith, Jesus says, And I tell you, you are Peter, and on this rock I will build my church (Mt 16:18). Now this passage is most frequently used to explain Peter’s primacy or leadership of the Apostles and the beginnings of the Papacy. And it does this, but it also says so much more. Notice how Jesus speaks of the Church as His Church? I will build my church (Mt 16:18). He didn’t call it Peter’s Church; He didn’t call it the Apostle’s Church; He didn’t give it to anyone. The Church belongs to Jesus (cf. Col 1:18)! It’s His Church, not Peter’s, not the Pope’s, not the Archbishop’s, not mine, not even yours or ours… It is Jesus’ Church! This is really important point: I wouldn’t be able to repeat it enough. You see, in Baptism we were baptised not just into a community, but into Christ (cf. Rom 6:3; Gal 3:27). Through Baptism we belong to Jesus: He purchased us with His blood (cf. 1 Pet 1:18-19; 1 Cor 6:20). That’s why we often refer to the Church as the ‘Body of Christ’ (JPII, General Audience, Nov. 1991; cf. 1 Cor 12:27). Our membership in the Church isn’t one of ownership, but one of participation: we don’t own the Church, rather we belong to her because we belong to Jesus. That means, then, that none of us own the Church — not even the Pope —, but all of us are children and servants of the Church. Jesus Christ is her Master, not us. This has been the guiding principle of all of the Church’s teachings: they’re not hers, they’re Christ’s teachings. How often we forget this detail! But notice also how He’s not merely the ‘owner’ of the Church, He’s also her builder: I will build my church (Mt 16:18). We must never forget that the Church exists not because of what we say or do, but because Christ is building her up. The Church has existed almost 2000 years not because we’ve had great Popes, Bishops and Saints — anyone who’s read the history of the Church knows we’ve had some pretty terrible people over the centuries. But the Church has lasted so long because it’s Jesus who acts in and through her, despite sinful people. It’s Jesus and the Holy Spirit who build the Church; who make Saints in every age according to what’s needed; who lead and guide the Church; who build her, perfect her, expand her. We must never think that the Church depends on us; she depends, and must always depend, only on Jesus Christ. Our task as members of the Church is to make ourselves open and available for the Spirit to work in us; the rest will follow from this according to God’s plan. And finally, notice how Jesus adds and the gates of Hades will not prevail against it (Mt 16:18). No matter how bad things get in the world, no matter how confusing things get in the Church, not matter how wrong (or how mean) a Priest or a Bishop might be, the Church will never be lost, Hell will not prevail against her. The moment we think everything’s ‘going to Hell in a hand basket’ and that the Church is lost, pride and fear take over and we make Jesus out to be a liar, and we cause scandal and division in the Church — just look as how many different Christian groups there are. The Church isn’t ours: she doesn’t belong to us, nor does her survival depend on you or me. The Church belongs to Jesus, who is her source of life and her guarantee. That’s why, my brothers and sisters, we must never loose hope, never despair. The Church doesn’t depend on mere mortals, but on Jesus Christ, who has conquered sin and death and sits at the right hand of the Father. We only need to trust in Him, and open our hearts so that the Spirit might work in us to build us up into holy members of His Church; that we might become living stones in that Church (cf. 1 Pet 2:4-5). Amen. Ps 145 R/. You open your hand to feed us, Lord, and satisfy our needs. In our Gospel passage today, Jesus puts the Apostles to the test: you give them something to eat (Mt 14:16), He tells them, before a crowd of more than five thousand. Jesus challenges His disciples to trust in Him, and to use the small amount of food they have to feed the multitude. Sometime around the 1980’s, many sceptics began to dismiss the miracles of multiplication that Jesus did. It was just a ‘miracle’ of sharing, they said; when people saw how the disciples were ready to share the little they had, others began to share their lunches too. Well, if it were just a nice story about people being kind to one another, then it really has no place in the Bible! Because the Bible isn’t about ‘nice’, it’s about Christ! And Christ is God among us (cf. Mt 1:13), and all things are possible for God (cf. Mt 19:26). Just over twenty years ago, my parents decided to move to the Edmonton area, and so we came to look for a house. We weren’t sure about our real needs or in which neighbourhood we wanted to live, so my parents were looking to rent. But our search for a decent rental was quite disappointing — even depressing (!) —, and we soon realised we had to buy. But putting together an unplanned down payment was going need a miracle. Looking for some direction and some hope, early one morning my Dad turned to the Bible, as he often does, and began to read and pray. He came upon this passage of the multiplication of the loaves and was really struck by God’s overwhelming generosity in providing for His people. So after breakfast and sharing his prayers with Mom, Dad called us all to the table for a family prayer meeting. He read us the passage and shared with us how he felt God was asking us to give Him our ‘loaves and fishes’ so that God could multiply them. So Dad emptied his pockets and put money on the table as a symbol of his loaves, and spontaneously we all followed suit, offering whatever we had. On an inspiration Dad also decided to include the family car, so he added the keys to the little pile. And with this we prayed, offering to God our loaves a fishes, asking Him to multiply them so that we might be able to buy a house. That afternoon we went to visit a house. When we got there, the elderly man who owned it said he couldn’t let us in because the realtor, who had the keys, was in Toronto. As it turns out, the man was a developer, and so as not to waste our trip to St. Albert he insisted we come to see his new homes, even though they were far beyond our finances. And so we went. The houses were beautiful, just the size we needed, and they were in a great location. It became clear to us that God had brought us here, and we began to feel that we had found the house the Lord wanted to give us. But we still didn’t know how the finances were going to work out. However, we trusted that God wouldn’t disappoint. So Mom and Dad went to the bank, but the developer — who had great compassion on my parents with five teens — had already made arrangements with the manager. He was vouching for the down payment so we didn’t have to put one down, and since his daughter was a lawyer, she drafted up the papers, and there were almost no closing costs either. We moved into our new home in late August, a week before school began. But because the paperwork was slow, we ended up living in the house payment-free for two months, which gave us enough money to buy a second car, as my parents were teaching in opposite ends of the city. The Lord is gracious and merciful… His compassion is over all that He has made (Ps 145:8, 9)… He opens His hands to give us our food in due season (cf. Ps 145:16, 15). Just like the loaves and fishes, God multiplied our little pile of change and keys. The Lord does indeed work miracles! And we need to ask and expect them from Him. But we first need to trust in Him, and we need to offer ourselves to Him along with our loaves and fishes, whatever these might be, however little, however few. We must never think that it’s not enough, because God isn’t concerned with quantity; He’s concerned about us. Notice how in the Gospel the multiplication took place because Jesus had compassion for them (Mt 14:14). Whatever we might offer to God is grossly insufficient, and Jesus knows that better than we do, but He nonetheless says, Everyone who thirsts, come to the waters (Is 55:1). Come, because He will make it sufficient; He will multiply our offering, our love, so that we’ll even have lots left over. We need only trust in Him, love Him, and give ourselves over to Him. God wants to bless us, and not just in material ways! God wants to fill us with His spiritual gifts, His grace — and in abundance! He wants to make us holy and perfect in His sight (cf. 1 Thes 5:23); will we allow Him to do so? Will we offer ourselves to Him so that He might multiply in us His grace? Amen.